Part 1: Guest speaker at the recent Probus meeting was Nina McNeary, who came along to tell the members about “The Antrim Gardens Project”. The tale she told was of a mystery worthy of an Agatha Christie story, and it certainly gave 'the little grey cells' an airing. The first puzzle was that the talk's title didn't refer to the County Town and its castle, but was in fact all about Portrush! Why and how? The answer to this early brainteaser, was the current 'Atlantic Hotel'? This stands on the site of the old 'Northern Counties Hotel', which, before it burnt down in 1990, was once, in its hay-days of the early 1900s, one of the finest hotels in the province. However, the origins of the hotel date back further. Before its major refurbishment in the 1890s and name change, it had been on the site since the 1870s, when it was called 'The Antrim Arms Hotel' - and the hotel gardens (now the green square in front of the building), was the beginning of the mystery. It has been claimed for many years that on the Hotel gardens, a church once stood. In 1926, the popular opinion was that the gardens once housed an Abbey. The simple solution to these ideas would normally be to consult land records and old maps. From the early maps, there was no evidence of any construction prior to the 1870s. The land records were not so clear either, as tithe payments are shown for the general area, but these seemed to be also linked with Ballywillan Church, which can be dated back to 12th and 13th century. However, there is also a record of a Knight 'taking a pile' in 1540 - a 'pile' the common term for a large house or building in the area. Further back to 1305 and there is a record of a land grant being made here, but there are no details of what it was granted for. In 2005 funding was provided for an 'Archaeological Dig', which uncovered the foundations of a structure along with some bones, pottery fragments and fishing equipment, but nothing to indicate any church connection. Interestingly, among the fragments was part of a Roman pot, dated around 70AD. However, it does NOT mean that this is evidence of Romans living in bygone Portrush, for in the 13-1500s it was a strongly held belief that bringing home a relic like this from the Holy Land, then grinding up part of the fragment and swallowing it, would bring about a 'miraculous cure' (or early death!). Recently, a special grant (£25K) was given to carry out a form of radiological survey. The initial results are a little disappointing. Although there was no clear signs of there being a church like structure, there is something that could be a building, which needs further study. Also, a search of 15th Century Papal taxation records shows payments specifically for 'Porto Rusho' and nothing for Ballywillan. Also, a map from 1469 shows that 'Porto Rusho' was a main trading port for this part of the known world. And so, where does the mystery take us to next? Could the 1540 'Pile' be connected with trade? Or perhaps a Priory for Papal tax and for trade merchants, storing and working from the building? Could that be the church connection? Or is there some other purpose yet to be discovered? The mystery may not have been solved YET, but the next step is to gather all the evidence and findings together, and present it at a special Portrush Community Fair that will be held in June this year - and perhaps those 'little grey cells' will have come up with an answer by then? With special thanks to Graham for providing this excellent summary below, for the club minutes. 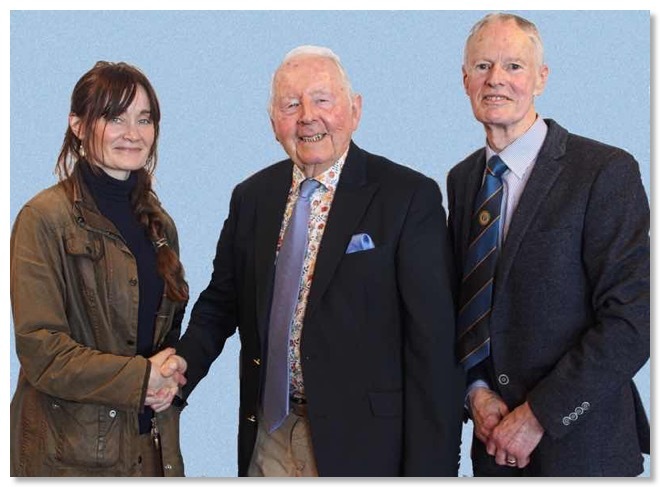 Part 2: President, John McGlade, introduced this mornings speaker, Nina McNeary, from The Causeway Heritage Consultancy, the topic of her talk being ”The Antrim Gardens Project, Portrush”. Nina is an Archaeologist and Facilitator of Heritage and her aim is to enhance cultural and historical awareness. In 2005 a small scale excavation was carried out in Antrim Gardens, Portrush, an open public area originally the gardens of The Northern Counties Hotel, a building sadly destroyed by fire. Local folklore would suggest that an ancient church was located in or near the gardens. Nina’s talk outlined the history of Portrush, an Edwardian seaside town which had developed from a small fishing village. A map of 1606 indicated an ancient settlement just south of Ramore Head. A church at Ballywillan, synonymous with Portrush, is listed in the1306 Papal Taxation at a relatively high value. Interestingly the excavations at Antrim Gardens exposed different layers producing artifacts such as fishing hooks, grinding stones, Mesolithic material, local pottery, French and English pottery and Roman pottery dating from 70 to 230 AD, probably fragments of a traveler’s souvenir. There was also evidence of a well on the site. According to The Rev Ford (1926) human remains were unearthed in the area and the walls of an ancient church were still standing at the beginning of the 19th century. Historical research certainly relates to a Norman church at Ballywillan in the late 12th or early 13th centuries. The data collected by a recent Geophysical Survey produced no evidence of a church at the Antrim Gardens site. The project commenced in 2005 concludes in June 2019. Members wishing to view Nina's interesting presentation, please 'Click' the logo below. For minutes of our 2018 meetings, go to our Archive pages. 29th Jan. The Club A.G.M. 2nd April. Alan Jeffers and the "PORTRUSH REGENERATION PROJECT"